Travelers' Tales Guides, 9781609521691, 240pp. "What's the strangest thing you've ever seen or experienced?" Gina and Scott Gaille have traveled to more than 100 countries, including many off-the-beaten-path places in Africa, South America, and Asia. Wherever they go, they ask this question. Everyone has a story, and some are truly extraordinary. 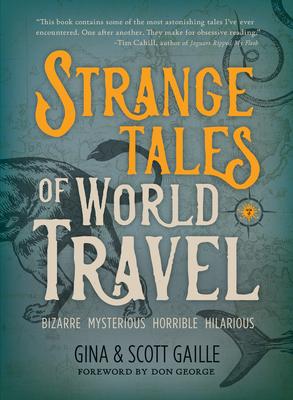 Strange Tales of World Travel presents unforgettable stories that celebrate the unique character of countries around the globe--and the distinctive characters that make travel endlessly intriguing and exhilarating. Gina and Scott Gaille grew up in small towns in central Michigan and south Texas. Even then, both dreamed about exploring the farthest corners of the planet. Gina's favorite TV show was Hart to Hart, whose globetrotting detectives--played by Robert Wagner and Stefanie Powers--journeyed to South America, China, and Australia. Scott spent Sunday evenings glued to Mutual of Omaha's Wild Kingdom, whose safari-jacketed host, Marlin Perkins, introduced him to exotic landscapes and their peoples. Gina is most passionate about Africa, where she once served as a missionary in a remote part of Kenya. Scott's career as a lawyer and academic at The University of Chicago and Rice University has taken him to more than 100 nations around the world, including 30 in Africa. It was their shared passion for experiencing the world that brought them together.